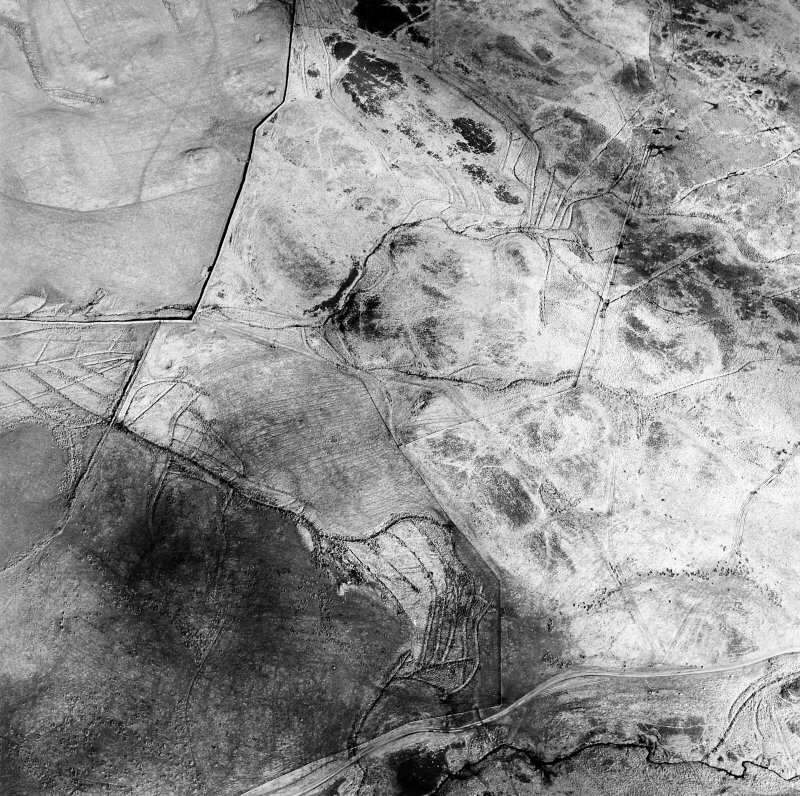 Oblique aerial view centred on the remains of rig and field banks with rig and linear bank adjacent, taken from the W.
Oblique aerial view centred on the linear bank, taken from the ESE. 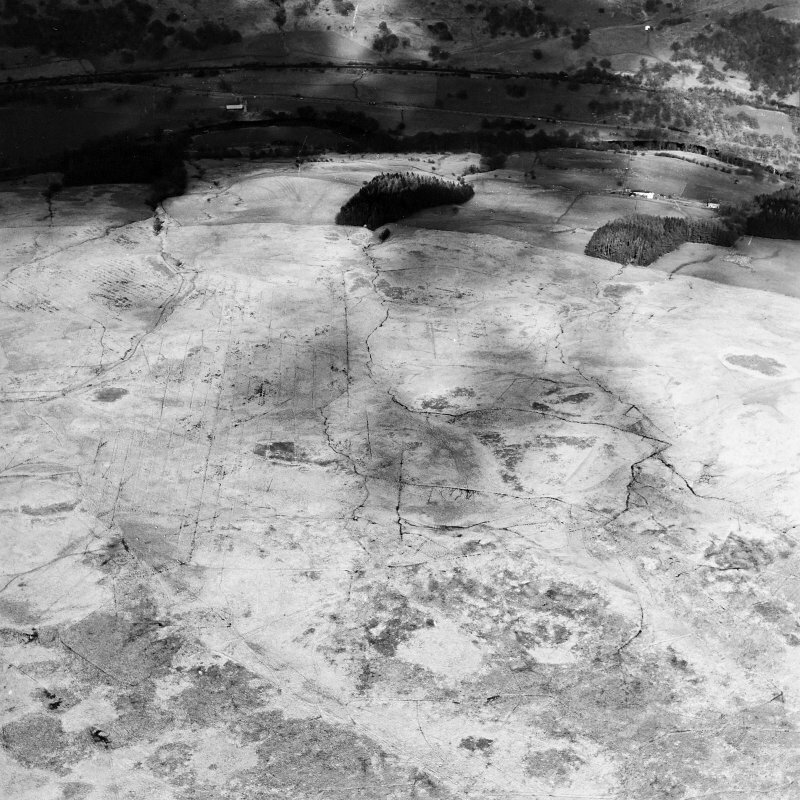 Oblique aerial view centred on the linear bank, taken from the E.
Oblique aerial view centred on the remains of rig, banks and quarries, taken from the NE. 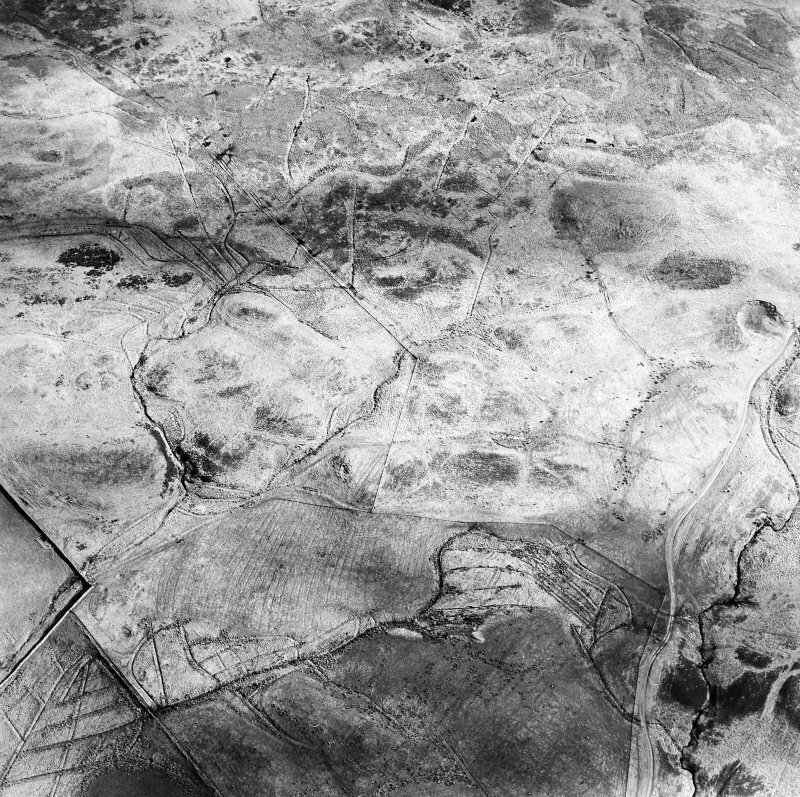 General oblique aerial view looking across the linear bank towards the River Nith, taken from the SW.
Oblique aerial view centred on the remains of rig and field banks with linear bank adjacent, taken from the NW. NS80NW 17 from 8000 0591 to 8339 0500. LIN 4. The earthwork that might be regarded as the Deil's Dyke proper extends from east of Afton Water (at approximately NS 6169 1142) to Burnmouth (at approximately NS 8400 0500). Its purpose and date is not known. It would perhaps fit more plausibly into the Dark Age period of racial pressures, recurrent warfare and general political instability. From 8000 0591 to NS 8260 0515: This section is indistinguishable and ploughed out in places (OS 1985). From 8000 0591 to NS 8005 0595: An earth and stone bank, 4m wide and 0.5m high (JRL 1978). At NS 8020 0601: A bank enclosing rig and furrow on the N (downhill) (JRL 1978). At NS 8027 0602: The point of intersection is obscured by modern drains. The similar bank is 2m wide and 0.4m high. (JRL 1978). The Dyke is crossed by a similar bank, head-dyke, or boundary, which runs for about 400yds between Hawkscleuch and Minny E'Burns (Graham and Feachem 1956). From NS 8030 0603 to NS 8037 0602: The Dyke is mutilated on the steep burnside (JRL 1978). From NS 8037 0602 to NS 8050 0600: The line of the Dyke is indeterminate (JRL 1978). The Dyke disappeared for some 230yds unless the OS line round the knoll is accepted (Graham and Feachem 1956). 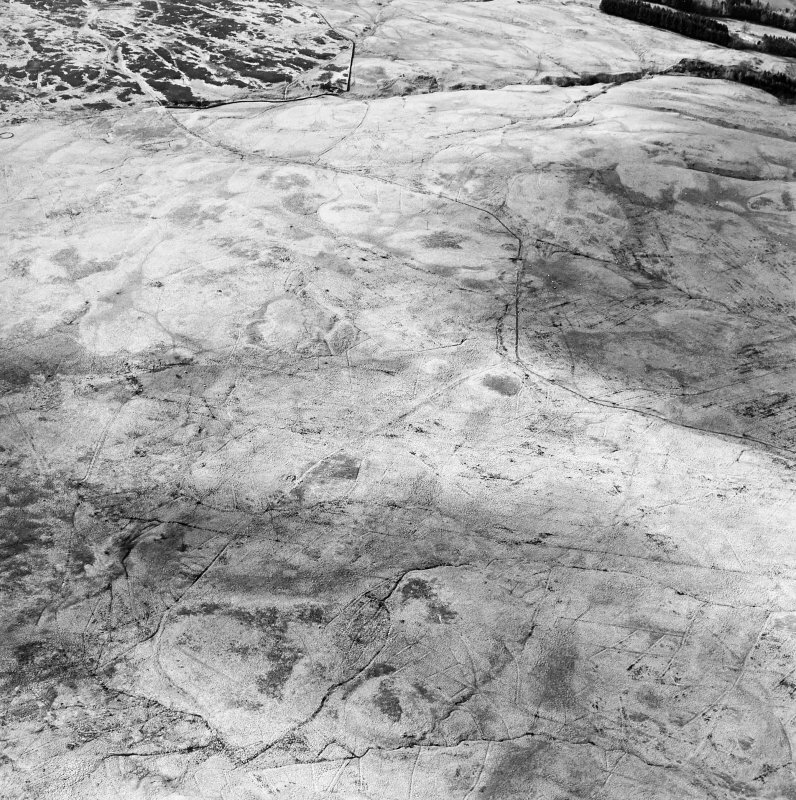 From NS 8050 0600 to NS 8087 0596: The Dyke is poorly preserved and fragmentary (JRL 1978). At NS 8089 0597: The Dyke is destroyed (JRL 1978). From NS 8093 0596 to NS 8216 0579: The Dyke turns the northern shoulder of Giengenny Hill and runs W to Cowan Burn. This section has not been visited (Graham and Feachem 1956). 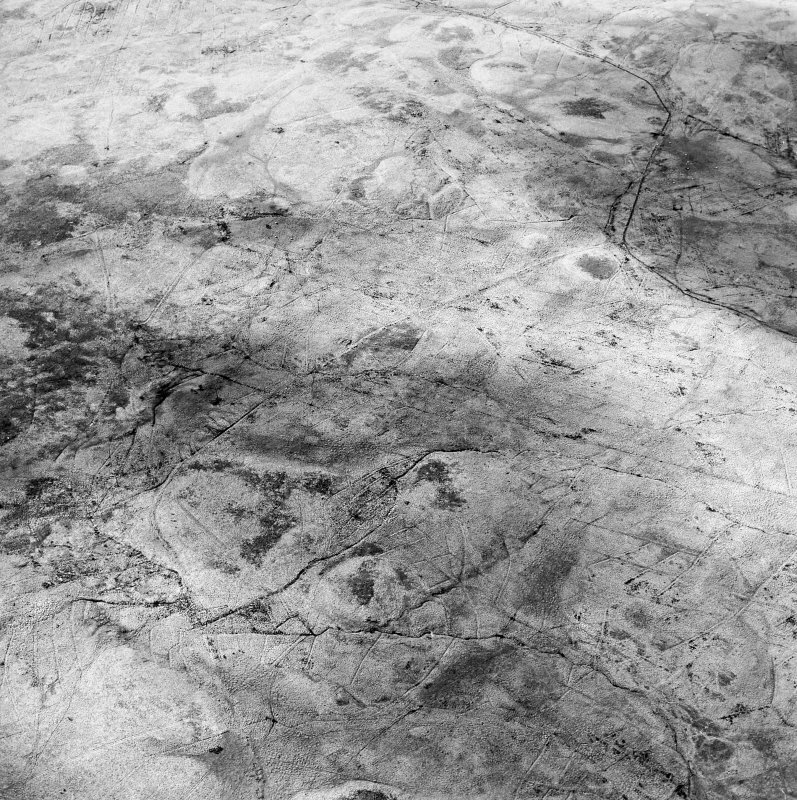 From NS 8093 0596 to NS 8150 0591: The Dyke is poorly preserved and fragmentary (JRL 1978). From NS 8150 0591 to NS 8213 0591: The modern wall is on the line of the Dyke. The bank is insignificant, 3m wide and .05m high (JRL 1978). From NS 8213 0591 to NS 8266 0541: The Dyke follows an irregular course to take in good arable land. There are no associated structures (JRL 1978). From NS 8216 0579 to NS 8272 0535: There is a well marked bank, 6ft-9ft thick and up to 3ft high, without a ditch. Some 600yds from the parish boundary, a similar bank crosses Deil's Dyke. The point of intersection is lost in boggy ground (Graham and Feachem 1956). At NS 8258 0545: There are no signs of a structure in pocket (Graham and Feachem 1956). From NS 8266 0541 to NS 8272 0535: This section is a sharp profile, 2m wide and 0.7m high (JRL 1978). At NS 8268 0526: This section is of more or less recent appearance (Graham and Feachem 1956). 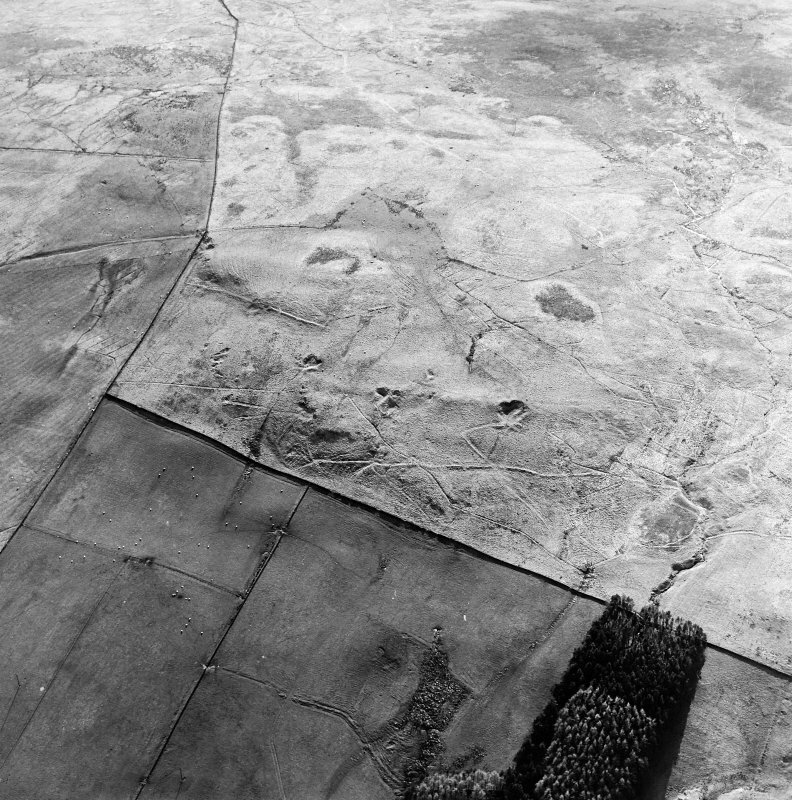 At NS 8272 0535: The Dyke runs from the head of the small sike tributary to Cubie's Cleuch to the slight angle in the parish boundary wall (Graham and Feachem 1956). From NS 8272 0535 to NS 8298 0518: The 2m wide bank continues to the burn (JRL 1978). From NS 8300 0518 to NS 8304 0511: The course of the Dyke is lost in modern drainage (JRL 1978). From NS 8304 0511 to NS 8339 0500: The course of the Dyke is obscured by farm track (JRL 1978). At NS 8404 0526: Deil's Dyke proper no doubt originated on the left bank of the Burnsands Burn at or near its confluence with the R. Nith (Graham and Feachem 1956). Visited by OS (JRL) 24 April 1978; Information from OS May 1985. A Graham & R Feacham 1956.